Do you love Eminence? Do you share your love of Eminence with your friends or family? Sunrise Wellness Spa invites you to bring a friend to experience Eminence. Did you know Eminence is Organic and Biodynamic ®? Eminence meets the highest standards of overall social and environmental performance, transparency and accountability. Eminence uses a cold pressed process to ensure the organic fruits and vegetables used in their products do not lose their vitamins and minerals. Heat affects the nutritional content and potency, therefore; no heat is used to make Eminence Skin Care. Each product is free of parabens, animal by-products, propylene glycol, sodium lauryl sulfates, harmful colorants and fragrances, mineral oils, and petroleum. Even the packaging is made from post-consumer recycled materials. All nontoxic. Did you know Eminence is committed to planting a tree for every retail item sold through a program called Forests for the Future? Eminence is the first and only skin care company to have planted over 11 million trees. Did you know that Eminence Kids Foundation is a 501(c) 3 nonprofit dedicated to providing seriously-ill children in hospitals and long term facilities worldwide with a supplement of organic foods to aid in their recovery and healing? A portion of the proceeds from every Eminence Skin Care product sold support the Foundation. Eminence has provided over 75,000 meals to sick children. 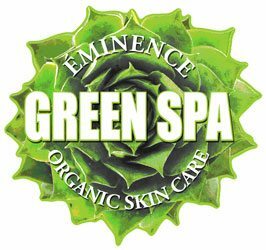 Did you know Eminence was voted by American Spa Professionals as being the favorite Organic Skin Care Line for 10 consecutive years? Would you like to receive 25% off your purchase? Bring a friend or family member that has NOT experienced Eminence and you will both receive 25% off your Eminence purchase. THIS IS ONLY A SUNRISE WELLNESS SPA PROMOTION!!! This Promotion is only available until January 31, 2019. Plan a shopping date and come in during regular business hours. We are also open Saturday January 19 for your shopping convenience.